It was another outstanding spring day for Scarborough. 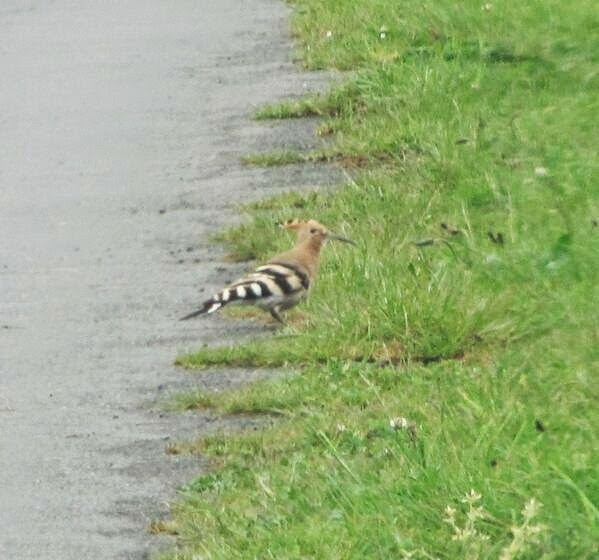 For starters, late news from yesterday was received concerning a HOOPOE which was seen briefly down War Dike Lane at Ravenscar, it was unsuccessfully searched for during the morning however the original finder came across it again along Bent Rigg Lane during the evening, it will hopefully still be present tomorrow. But it was at Long Nab again where the real action was at, claiming yet another first for Scarborough! This time in the form of a BLYTH'S REED WARBLER! The bird was discovered in song during the morning in Hundale, the bird was trapped and ringed early evening and was relocated to Crook Ness due to the fact Hundale is a private site where there are clear access issues. Also in Hundale were 2 Lesser Whitethroat, 2 Willow Warbler including one northern bird and the Wood Warbler present for its 3rd day and a Wheatear was near the Hut. Elsewhere a Whinchat and 2 Cuckoo were at Ravenscar, and a Wood Sandpiper was on Johnson's Marsh. On the move at Long Nab (south unless stated) were 1 Red-throated Diver north, 4 Fulmar + 18 north, 2 Manx Shearwater north, 1 Cormorant north, 2 Greylag Geese north, 2 Shelduck, 8 Common Scoter north, 5 Lapwing west, 7 Black-headed Gull north, 1 Common Gull north, 2 Lesser Black-backed Gull, 1 Great Black-backed Gull, 39 Kittiwake north, 9 Sandwich Tern, 320 Auk sp, 1 Puffin + 3 north, 56 Swift + 28 north, 7 Sand Martin, 58 Swallow + 2 north, 26 House Martin, 3 Flava, 3 Carrion Crow + 13 north, 4 Goldfinch and 12 Linnet. So with the two latest additions to the year list putting it onto 201, the question is, what next? ?